Pet t shirts are a great way to show pride in your super spiffy pet! Below you’ll see our “best of” collection of super spiffy pet t shirts for you to drool over. 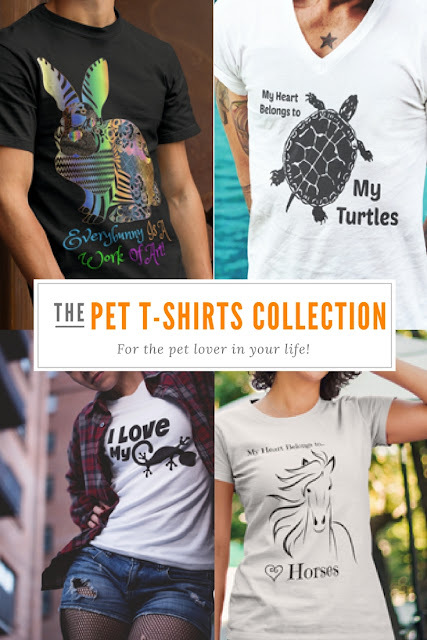 You can always skip right on over to the specific pet shirts you are looking for by using the links right here. And don’t worry if you don’t see your type of pet listed, we’ll be adding more all the time. We all know that the internet runs on CATS but do you? If so, we humbly suggest you take make a point of announcing it to everyone with the above cat Tshirt! Take a peek below at some of our best selling shirts or visit our Cat Shirt Collection to see them all. Your wiener is what? Oh my, we aren’t gonna get in the middle of that discussion. Honest, all Dachshund’s are equal in our eyes but you are more than welcome to proudly proclaim yours the best with this delightfuly dog tshirt! Follow our full collection of dog shirts so you’re always the first to know when new ones come out. Do you know the joys of being owned by a bird? Or maybe you’re a bird watching enthusiast. In either case you have to admit there’s nothing quite like it in the world. I mean seriously, most folks get a little squidgy at the idea of bird poop. But not us. We proud bird mama’s and pappas wear it as a badge of pride! These bird shirts will tell the world how you feel in a way THEY will understand. Just check your shoulders before heading out in public, ok? Oh, and here’s where you can find the amazing owl shirt above. Whether it’s gecko’s, rats, hedgehogs or snakes you love our Little Critters Collection has a shirt you are sure to adore! Be sure to check back often so you never miss a new one! If you don’t see the little critter YOU LOVE represented (or represented enough) be sure to let us know in the comments below and we’ll get some added for you asap! Possibly the most underrated pet in the world is the Pet Pig! Just ask Esther The Wonder Pig she’ll tell you LOL. Seriously, if you love pigs as much as we do, check out our ever growing collection of pig shirts right here. We promise, you won’t be sorry! Oh, and the pet pig sweatshirt above is right here. Folks who keep turtles know how adorkable they are. It’s so fun watching them paddle around and do the funniest things. Even land turtles (most folks call them tortoises) can make you laugh with their antics. But do you REALLY need all those turtles? Well DOAH! Of course you do! Celebrate your love of pet turtles with a spiftastic pet turtle t shirt! See the full collection right here. Chickens make delightful pets. Why is it that bird folks overlook them in favor of more exotic pet birds? They can be kept inside and will cuddle with you just like a parrot will and are desperately in need of a loving home. If “Chickens are my Spirit Animal” is your moto, then please consider adopting a chicken who needs your love. You can see all of our adorkable pet chicken Tshirts right here. Do You Like This “Pet T Shirt” Page?Please Share It With YOUR Friends. Thank YOU!